Pepper joined our family 8 years ago and hasn't slowed down! I have never been much of a dog person, but she and I have bonded quite a bit, especially since I have taken up running. She has been able to keep up with me for 8 mile stretches. She always sleeps by me, curled up behind my legs and loves to play frisbee and fetch. She doesn't quite get the idea of "giving" the ball or frisbee back, but that is the fun part for her! She has been a joy for our family and we love her to pieces! Join in and write your own page! It's easy to do. How? 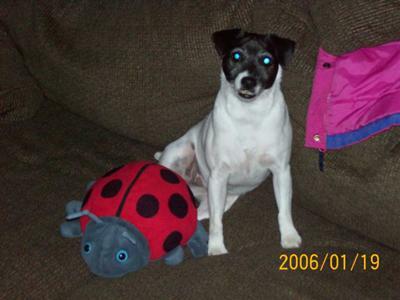 Simply click here to return to JackRussellTerrierPictures Submissions.